Possibly the Dukes of Gotha at Schloss Friedenstein. 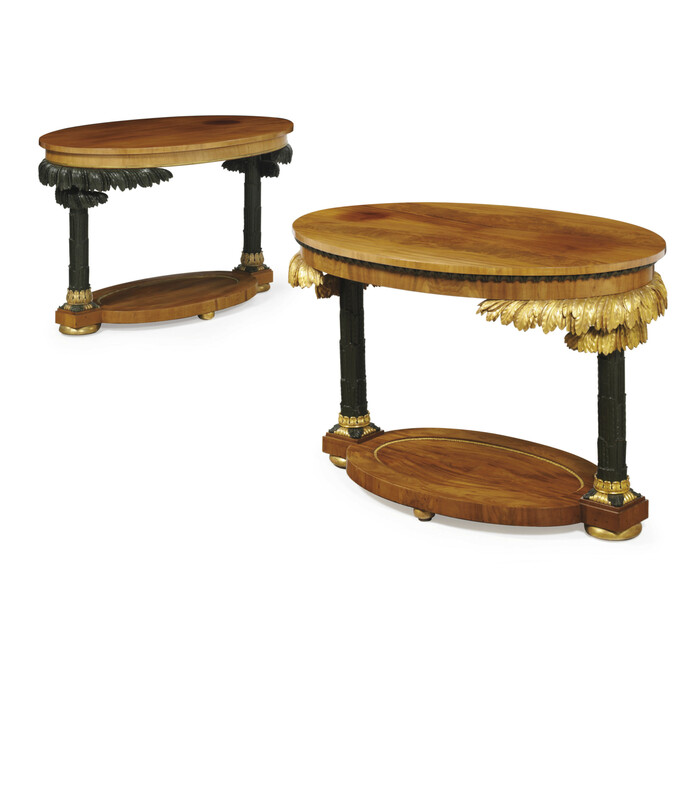 These striking tables with unusual palm-frond foliate carving are possibly part of a larger suite of furniture from Schloss Friedenstein, in Gotha, (near Thuringia), Germany. The suite included a fall-front secretaire and seat furniture which incorporates the distinctive foliate carving found on these tables into the splat of the chairs (see F. Luthmer and R. Schmidt, Empire und Biedermeier Möbel und Schlössen und Bürgerhäusern, Frankfurt, 1923.). Schloss Friedenstein was built in 1643 and dominates the town of Gotha. It was built on the site of the earlier castle of Grimmenstein, and provided a model for other palaes in Thuringia and beyond. A similar table, of circular rather than oval form, and presumed to be from the same suite, was sold from the Ingrao collection, Sotheby's New York, 20 October 2006, lot 164. Another almost identical but smaller circular table was sold from the collection of Gianni Versace, Sotheby's New York, 5-7 April, 2001, lot 380. PLEASE REMOVE THE DATE LINE FROM THIS LOT.